Every door – be it a front, balcony or garden door – tends to lose some of its appealing aesthetics through normal wear and tear as time passes. Furthermore, it is a fact that many older models no longer meet our demands like the newer ones do. When you decide to purchase new French or patio doors, you do not have to rely on professional help for the installation. Would you like to install French doors yourself? This manual will assist you, describing the entire procedure, step-by-step, and listing all necessary materials and tools. The necessary tools and materials are as important as the construction components. The following list shows all elements, which should be at hand at the working place when you start to install French doors. In order to install new French doors, the old systems have to be removed. 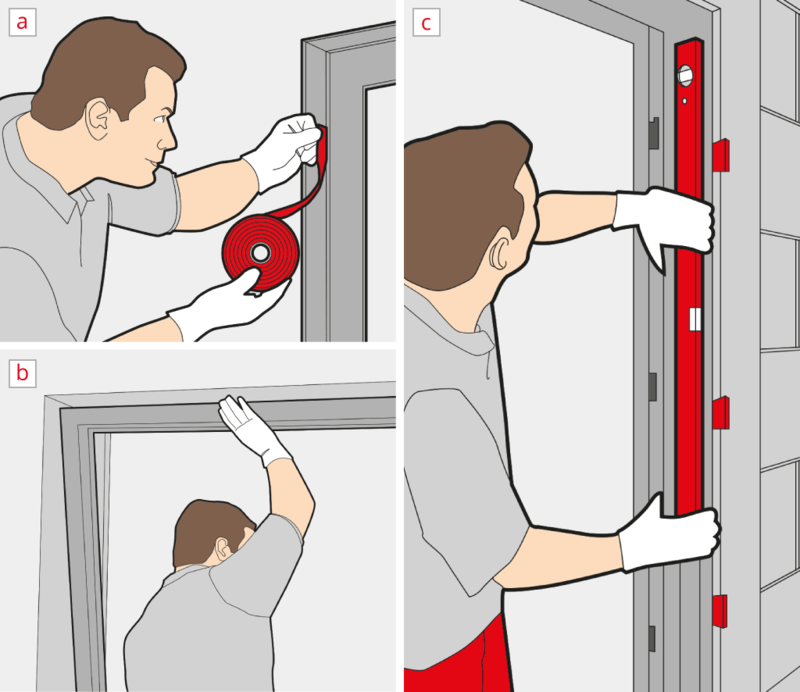 Here, you can find a detailed step-by-step manual to help with the removal of French doors. The measurements of the reveal and new component should be re-measured and compared before the installation. This step ensures that the installation may be performed smoothly. The respective blueprints of the house can be very helpful to check the constructional conditions. Thoroughly clean the surfaces of the French door reveal. Make sure that the surfaces are clean and free of dust. A clean surface is absolutely necessary, in order to install parts according to RAL standards. It will ensure that the sealing can be attached properly to the frame, and thus enabling energy efficiency (Fig. 1). Special attention should be paid to safety. Wearing working shoes, gloves and safety glasses can protect you from flying debris. If you want to install wooden, uPVC or aluminium French doors, a helping hand could be useful. New doors for the garden and balcony are normally covered with protection foil, to avoid damages to the frame during the transport. In order to install the system, it is necessary to remove the foil from exterior section – when it is still easily accessible. The rest of the foil does not need to be removed, because it will protect the aluminium, uPVC or wood surfaces during the installation procedure (Fig. 2b). Install the handle for the French doors first, so you can open the leaf. Remove the protection foil in the respective area and mount the handle, without opening the door leaf (Fig. 2c). 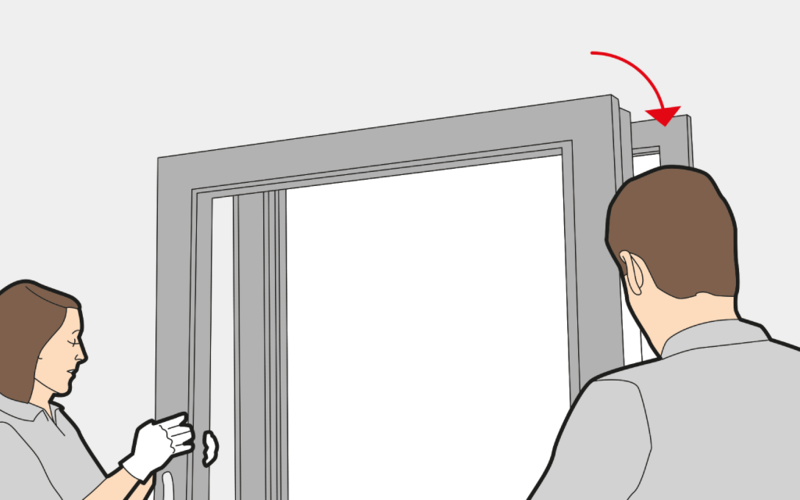 Use a screwdriver to remove the security pin from French doors, do this by pulling it in a downward motion (Fig. 2a). Lift the leaf out of its hinges in an upward direction and set it aside. Handymen can also find a detailed manual on the removal of the door leaf here. Massive door leafs should always be placed on a soft mat. This prevents damage to wooden floors and to the surfaces of French doors. After all preparations are made, you can start to install your French door. The installation of French doors when working in a group of two can be finished in about two to three hours – similar to the procedure with front and garden doors. This layer separates the exterior from the interior climate. When working with French doors you can work with vapour resistant foil or acrylic jointing (Fig. 3a). This layer is the primary element for thermal insulation. It needs to be filled with insulating 1-component-PU construction foam. In order to prevent allergic reactions, it is also recommended to install filling materials, such as cotton or mineral fibres (Fig. 3b). The "outer" sealing is very important, as it protects your home from atmospheric influences. This is the reason why it must be constantly impact rain proof and open to vapour diffusion. The insulation is normally achieved with pre-compressed tapes, silicon jointing or foil open to vapour diffusion (Fig. 3c). Do you want to skip these three different steps? Multifunctional sealing tapes combine the most important attributes of all three levels into one product. Here you can find a detailed description of this material. It is important to install high quality insulation materials correctly, to save money on energy in the long term. The accessory shop of windows24.com offers the right materials for all types of sealing for the installation of windows and French or patio doors. The installation of window frames and doorframes must to be performed very precisely. It is essential to use a tape measure and the accompanying washers for this step. Make sure that the selected sealing has been attached to the doorframe (Fig. 4a). Now the frame of the French door needs to be carefully inserted in the wall opening (Fig. 4b). Adjust the doorframe with a bubble level and the accompanying washers. Make sure it is in a perfect vertical and horizontal position. Incorrect adjustment can lead to problems with the opening and closing mechanism (Fig. 4c). Before you can continue to install the frame, it must be perfectly aligned. Drill the respective mounting hole with an impact drill and use a wooden or stone bit. Use the bubble level to check, whether the frame is still vertically and horizontally adjusted. Screw-in the accompanying screws to install the doors frame to the wall (Fig. 5). The work with an impact drill can loosen pieces from the wall. It is important to protect floors and surfaces from flying stone or wood fragments with a protective layer. The next step is the foaming of the gaps between the doorframe and wall opening. When using sealing tape for the outer level, the tape must fully extend before the foaming procedure begins. Fill the space between wall and doorframe with construction foam or filling materials. Please be careful with the dosing of the foam, as contact with air will lead to expansion of the material. If necessary, add more foam after it has fully expanded (Fig. 6a). Now attach the foil to the masonry completely. The use of acrylic or silicon jointing is also possible in this step (Fig. 6b or Fig. 6c). The installation of the doorframe is now almost complete. The final step is the insertion and adjustment of the door leaf. Make sure to mount the fittings (i.e. the catch and the necessary handle) on the leaf before inserting it. Install the leaf and check whether it can be opened and closed smoothly (Fig. 7). Readjust the door leaf if necessary. Do-it-yourself enthusiasts can find an instructional manual for the adjustment of French doors here. Energy efficient living can be achieved with the right windows and doors. This manual demonstrates the basics of fenestration and helps you save money on hiring professional help. Should you wish to install other products, the procedure is very similar for front and patio systems.